If you've read my review of Christopher Farnsworth's first Nathaniel Cade novel, Blood Oath, then you know how much I loved it and how I couldn't wait to read the sequel, The President's Vampire. I was not disappointed. Well, mostly, anyway--but I'll get to that later. In the meantime let me say that TPV is just as well-written and compelling as Blood Oath. In fact it left me kind of wishing real life were like these books (I don't know if that says more about me or Farnsworth's writing skills)! The big bad this time around is lizard people, or "Snakeheads," as they're called. Not only are they unnaturally strong and vicious but they keep evolving at an accelerated rate. But the really scary thing about Snakeheads is that they're created via virus--even minor contact with them can turn a human into a mindless killing machine (if they aren't turned into dinner first). Since Cade can barely handle one Snakehead at a time they're no small threat. As with Blood Oath the fun doesn't stop there. Farnsworth weaves in the enigmatic Shadow Company; political conspiracies; H.P. Lovecraft; the occult (bonus points for the use of "Book," "Bell," and "Candle" as character names); espionage; and a lot more of Cade's frenemy-with-benefits, vampire Tanya. Zach is given a bigger role, as well, and the gradual cementing of his relationship with Cade is one of the highlights of the book. Speaking of Zach's relationships, he also finally gets to hook up (check out the end of chapter 14). The author does a great job with this scene--it's neither sappy nor clinical; there are no cheesy euphemisms in sight; and I didn't feel the need to roll my eyes once. Not an easy feat to pull off--well done. I was a little disappointed, however, that Cade's nemesis, Johann Konrad, didn't make an appearance, but leaving him out was the right thing to do from a storytelling perspective. It would get fairly dull if Konrad were featured in every book. One aspect of Farnsworth's writing that merits further kudos are the glimpses into the minds of even minor characters, good, bad and neutral. Too often a character is killed off and the reader doesn't notice or care because they were so minor and/or one-dimensional. In the Cade novels you can empathize with these characters because you get to know them. It's interesting that a writer with such an impressive grasp of human intellect and emotion has created a protagonist with no emotions or humanity. Maybe that's why he's been so successful at inventing a unique monster amid a veritable sea of them. Unfortunately Farnsworth and TPV did suffer from a major liability: monumentally bad timing. The book begins with Cade in 2001 tracking down and killing Osama Bin Laden. I cringed as I read this only a few days after Bin Laden's highly publicized death in real life. This is why writers should hesitate to include current events as part of their fiction. For me anyway, it destroys suspension of disbelief and takes me out of the story, not a place I want to be as a reader. The discrepancy kept needling me until I finally decided to pretend that the recently killed Bin Laden was actually a double. Not a perfect solution but it sufficed. At least I could go on to enjoy the rest of the book. Cade prevails in the end (although he had me wondering). There are a few surprises along the way and a really satisfying conclusion. And once again I'm left waiting anxiously for the next Nathaniel Cade novel. At least I'm confident that it'll be worth the wait. Appearance: Very pale human with long, needlelike fangs that are visible when mouth is open or smiling. Vampires don't breathe or sweat. Strengths: Ability to jump great heights. Ability to move silently. Skin is tougher than Kevlar weave. Can ignore pain. Perfect memory. Enhanced senses. Sensitive to heat and warm-blooded creatures. Can crawl head-first down a wall. Weaknesses: The sun. Christian religious symbols (cause pain). Simple human interaction. Deep water (vampires are not great swimmers and don't float). Can't sense cold-blooded creatures. Mythology: Vampires are sociopathic, rarely feeling or displaying emotion. Book, the first man, was older than Zach--late thirties or so. He wore his hair cropped military-short and regarded them with dark eyes and a scowl. He kept his weight forward, on the balls of his feet, and looked hard and lean. If he was a data analyst, Cade was a vegan. Cade knew this would have to be handled delicately. "You're being an idiot," he said. 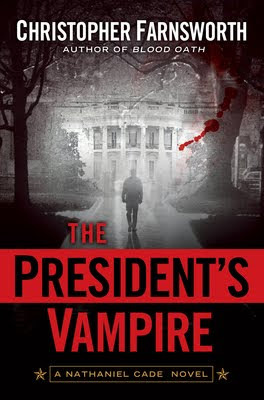 The President's Vampire by Christopher Farnsworth. From Putnam. True Blood Season 4 Premiere "She's Not There"